I am one of those who was appalled that the mural was covered and mightily relieved when it reappeared. I have trouble understanding how an informed community cannot understand the shifts in meaning of memes (that may be redundant) which occur and the application to physical objects created at moments in history. I am very happy to see this mural on display at The Log! Removing a representation that offensively depicts a long-oppressed minority as primitive or subservient because, in the period that representation was made, said minority was not considered fully human /= censoring or erasing history. I am not saying that’s what happened here — but I think there’s a problematic tone to the posts on this subject that implies that such a removal would be unacceptable. Somehow I get the impression you’re looking hard and finding something that isn’t there. But go ahead, make your argument. Can someone post any article detailing the decision to remove this? This has been widely covered at EphBlog. Start here and follow the links. I had fun with this one . . . Thanks! So…what’s the problem? Adding a caption giving the painting context sounds like a win-win for everyone. I took this “money shot” of the plywood with Eph Banners covering the art on this day two years ago. Right after the College covered the mural. Before it became news. Not sure if anyone else captured an image of the censorship? One of the interesting things about this image of the censorship captured as it existed in November 2015 is the way in which the lighting for the mural remained, and that the censor(s) used the lighting to highlight Williams banners on the plywood. I would imagine it was either a contractor or a Williams employee that cut the wood and tacked it up to cover the mural, but someone with institutional power must have decided to use the banners? Someone had to collect these banners for this particular purpose. 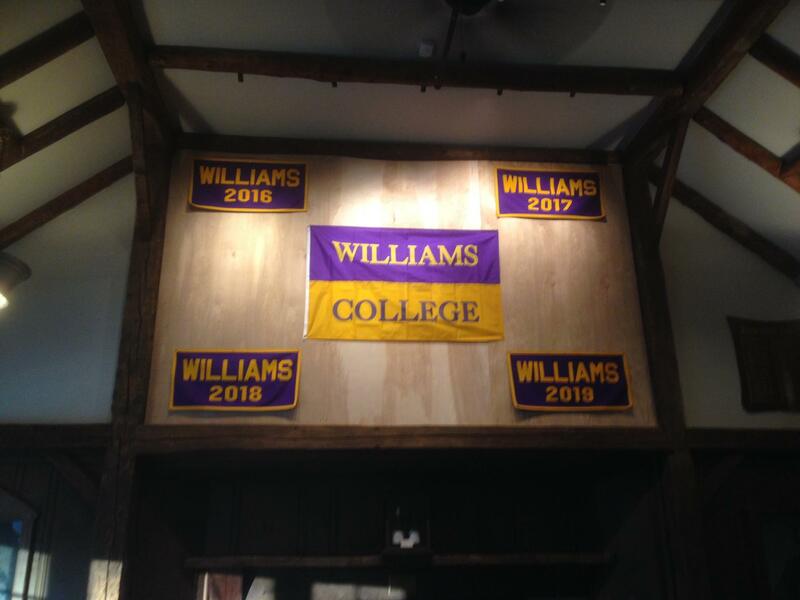 The highlighting of the Williams banners using a large center banner and then the banners for the current student graduation years made it appear as if the student body had come together in outrage to endorse this decision. 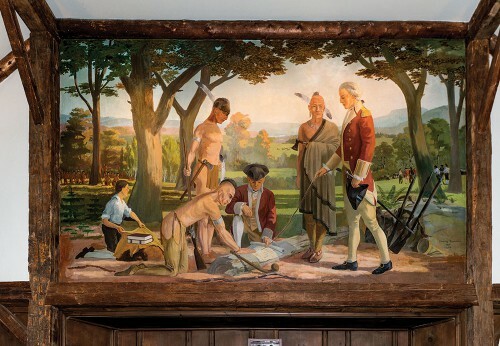 We do not find out until later that this depiction of unified community support for the censorship of the log mural was a false creation. The adding of this bit of propaganda to censorship “by accident or on purpose” is an interesting thing to think about it. When was it actually covered and who placed the banners? Why did the censor(s) choose to use the banners in this space in this way? It’s not just the covering of the mural which is fascinating, it is the liberty that the censor takes with other symbolism which creates a false assertion. A monopolization of perception that supports a false narrative of a community united in this decision. I find the way the censorship blends with this propaganda fascinating. My guess is that some college employee looked at the plywood, thought to themselves “that looks crummy,” and made the quickest and least controversial fix that they could think of in the moment (Williams banners). I agree that there’s reason to be cautious in not overreacting to the current movement against offensive/problematic representations–overreactions that lead to the removal of non-offensive or non-problematic images/monuments do not make anyone happier (except, potentially, for the administrators in question who get to claim the mantle of proactiveness). But I don’t see how a little administrative prudence — temporarily cover the potentially offending piece while quickly convening a broad-based panel to consider the issue — is a bad thing, especially where the ultimate result of removal is not pre-ordained by the process (which here it was not). Highly unlikely! It is too organized using the current class years and the layout is planned. The placement of the banners is measured and symmetrical. It had to be done from a ladder. This was done by someone (planned by someone who probably told B&G to do it) who wanted to, and did, send a message. That is what makes it interesting. And placing current year college banners over legacy art that has been censored by this generation of Ephs is controversial. It makes a statement. EphBlog is powered by WordPress and delivered to you in 1.138 seconds using 46 queries..